Dr Appliance is a Miami appliance repair company that is at the forefront of the appliance repair industry. We use only the latest technology and repair techniques to ensure a great all round service to our clients. We are dependable, efficient and take great pride in our work. Our team is comprised of the best technicians in Miami. 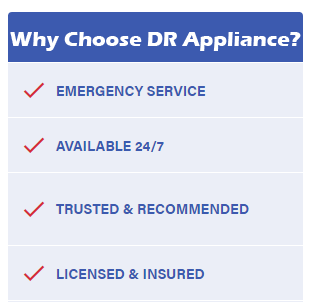 Whatever your repair needs let Dr Appliance’s highly qualified technicians come to your rescue. Are you looking for a reliable, affordable, and experienced team of technicians to fix your appliances? If yes, then you have come to the right place. Dr Appliance is a top Miami appliance repair company whose focus is largely on repairing refrigerators, dryers, dishwashers, and air conditioners among other appliances. It doesn’t matter how big or small the appliance is. Our expert team will take care of all that needs fixing or needs replacing. Our service fees are among the most competitive in the industry and we are well known for our excellence and devotion to our trade. We guarantee that you will be happy with our friendly customer service and the way that we do business. We offer repairs for both commercial refrigerators and residential refrigerators. We understand just how important refrigerators are, and how inconveniencing a non-working refrigerator can be. This is why when you call us, we don’t hesitate to come. We are there when you need your refrigerator repaired. Whatever is causing the refrigerator to not function, we will find it and fix it. Here at Dr Appliance, we have encountered scores of restaurant owners who have lost money because of a faulty refrigerator. If your refrigerator is experiencing problems, be it a broken seal or a gasket issue, or simply needs maintenance, we are the right people for the job. You can trust us. Are you experiencing difficulties with your dryer? Is your dryer not doing its job? Well, worry no more because Dr Appliance is here to solve the problem. One quick phone call to our experts and we will have your dryer up and running in no time at all. Our technicians only have to inspect the dryer and give you a quote before they start work. We have one of the most competitive rates in the industry. We deliver real value for money. Don’t hesitate to call us if you ever need help fixing either your residential dryer or your commercial dryer. Washing machines take the hassle from having to wash your clothes by hand. Sometimes we forget how easy we have it until our washing machines stop functioning. It’s not the end of the world, however when your washer stops working. Thanks to our highly trained technicians, you can have your washer up and running in no time at all. We are used to fixing washing machines which aren’t spinning anymore because of defective lids or burned out or cut wires. We know how to rectify washers that vibrate too much, and those that don’t let water drain out efficiently. If your washer’s problem is water leaking out of it, we can also fix that. All you have to do is pick up the phone and call Dr Appliance, the top Miami appliance repair shop in the city. Dishwashers, just like most of today's machines exist to simplify our lives. However, when these machines break down life becomes anything but simple. Thanks to Dr Appliance, however, your life doesn’t have to get ruined because your dishwasher stopped working. We are more than able to fix whatever is ailing your dishwasher. If you notice any of the following problems with your dishwasher, it might be time to call us. Having regulated air conditioning is very important in Miami. Here at Dr Appliance, we take AC repairs very seriously because we know just how important they are in keeping the inside of homes and offices regulated and providing an ambient atmosphere to both work and relax in. If you are having trouble with your air conditioner, you don’t have to look any further than Miami appliance repair experts Dr Appliance. We will be there when you need us. Our services are affordable. You will never be surprised by any hidden fees. Everything is upfront and we even offer a quote before we start working so you know exactly what we are going to do and how much you need to pay. If you look around we are sure you won’t find a better team of technicians than ours nor a better service quote either. If you need to talk to someone about your appliance repairs, don’t hesitate to call us here at Dr Appliance.